Home » All Articles » The perils of thanking power, pt 1: In fairness to Kelli Stargel, how would she have known? The perils of thanking power, pt 1: In fairness to Kelli Stargel, how would she have known? Posted by Billy Townsend on Apr 12, 2019 in All Articles, columns | Comments Off on The perils of thanking power, pt 1: In fairness to Kelli Stargel, how would she have known? The context for Sarabeth’s statement is our board discussion of the new taxpayer-funded, no-oversight grifter school vouchers that your state government is about to create. I’ll talk about that in part 2. But the statement itself has more general application; and I think Sarabeth has fallen here into a common trap for public officials. She’s confusing personal relationships with power relationships. “Flies with honey” is good advice for personal relationships, which are rooted in affection and love, as anyone in a strong marriage can tell you. Power relationships are very different relationships. They are not marriages or friendships or even co-worker collaboration. They decide the distribution of public goods. They are about who eats and who serves; who thrives and who suffers. 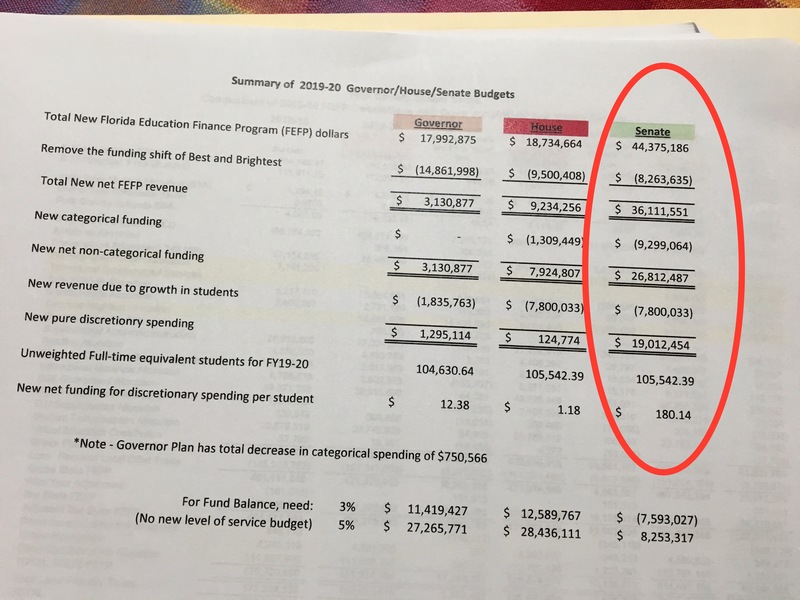 So Sarabeth’s statement makes a great jumping off point for exploring why the Florida Senate education budget is so much less bad than the governor and House budget. The image below shows the difference. Click to enlarge. The Senate budget is circled; and this Ledger story has phone numbers and email contact for legislators. I’d urge you to call them and tell them to support the Senate budget. Note the use of the word “chose.” She made an active, publicly beneficial decision that she has not made in the past. Why? To answer that question, let’s imagine Kelli Stargel’s decade-plus in the Florida Legislature from her point-of-view. 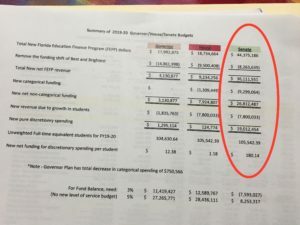 It’s simply not arguable that the Florida Legislature has made it far harder for local institutions to serve their citizens and respond to local demands for service in the last decade, while prioritizing the interests of the political donor class. I am sure Kelli Stargel was thanked personally by these powerful interests in many conversations; and I know that she was thanked through political contributions simply by looking at them. That’s not terribly remarkable. What is remarkable is this: for most of her 11 years in office, when Stargel came home, the leaders and advocates of those same institutions she hurt with her actions thanked her for it, over and over again. In Polk county, having an “R” on your uniform can cover of multitude of ground-level policy sins, even when some of your worst ideas come right out of discarded Democratic policies, like VAM. Here are the consequences of that, expressed in funding for your schools and teachers. Now think about this from Kelli’s point-of-view: They’re thanking me in Tallahassee. They’re thanking me at home. Nobody’s primarying me; and I keep winning elections. No reason to stop strangling our public schools or sticking it to teachers with VAM and forced transfers. No one really cares about them anyway. I’m all good. It’s hard to blame Kelli for that. How would she know otherwise? For years and years, no one really told her. Why would she “choose” to do anything different if everyone’s thanking her for her servant leadership? Why wouldn’t she take everyone at their word? It’s kind of unfair to expect otherwise. Consider those questions in light of Sarabeth’s reaction to very minimal steps to address a safety crisis caused by legislators themselves, through a wildly irresponsible taxpayer-funded voucher expansion that Sarabeth opposes, along with the rest of our board. This is how she proposes we communicate with legislators about Pastor Tiger school oversight. What conclusions do you think our legislators will draw about the seriousness of her opposition to this safety crisis? 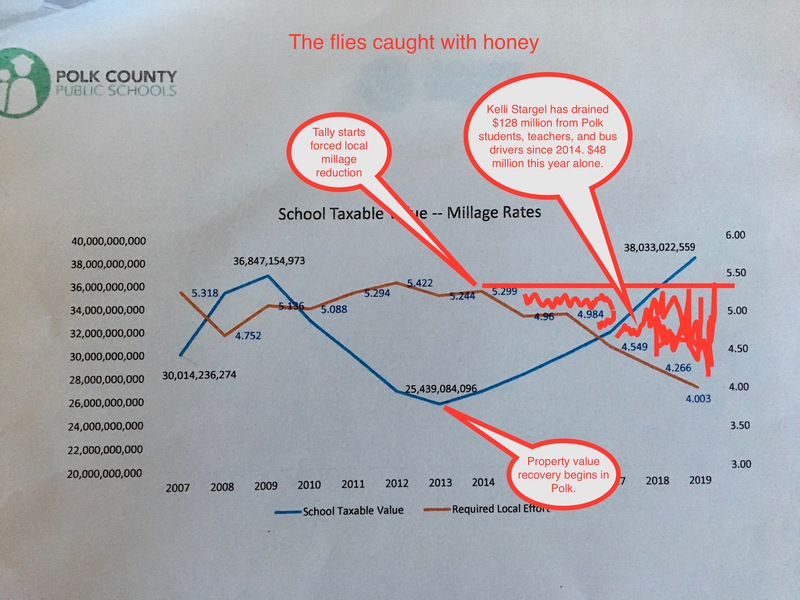 How do you think your legislators factor that honey and those flies into the mental equation weighing Tallahassee benefits versus local harm? I agree that Sarabeth’s response will make Kelli Stargel happier to see Sarabeth at a Chamber event than she would be to see me. But I am not sure that translates into better protection for kids and taxpayers. You may have seen this clip of Tom Izzo, Michigan State basketball head coach during the NCAA tournament. In my observation, people’s reactions to it largely overlapped with their relative power in life. Powerful people loved it. Look at that guy holding people accountable the old-fashioned way. How else will they learn? People on the receiving end of power tended to see it differently. I should say I’ve coached youth sports quite a bit; and I am not that kind of coach. I’m honest with my kids; and they’ve always played hard for me because they know I’m rooting for them. But I try to avoid humiliation. That probably reflects my understanding and views about power. However, I am something of an Izzo, minus the physical confrontation, when it comes to coaching adults who wield official power. I punch up, not down. And in my experience, powerful people are much less excited about Izzos when they get Izzoed. Indeed, it’s always amused me how many of the same people who complain about participation trophies for nine-year-old baseball players want to be thanked for their service in Tallahassee, regardless of how many real people it damages. It’s less amusing how willing local leaders often are to give them those participation trophies. 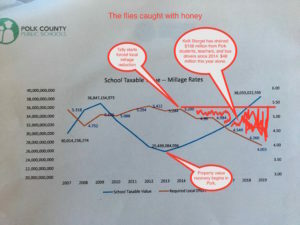 It wasn’t until a lot of local officials, of which I am one, started coaching Kelli Stargel assertively that you began to see some change in her behavior toward our local institutions and their missions. In education, it really wasn’t until Debra Wright and then Bob Doyel challenged her, and I started coaching her publicly like Izzo every day, that education compression funding started showing up in her budgets. Or that VAM was made optional (still a factor in a bad way, but less so). Or that, for the first time in her career, she “chose” to prioritize public education funding in a Legislative session this year. How else was Kelli Stargel going to learn if we didn’t tell her the truth? She’s still got a long way to go to be the legislator that she can be; but in the spirit of tough, but supportive, coaching, I think I can see some improvement. I want to see much more.